As soon as we exited the MTR station, we came face to face with a slew of activists representing various political parties and factions, touting their messages and asking for money. Agnes Chow Ting was a face I recognized, but I ignored Demosistō and all the other parties. 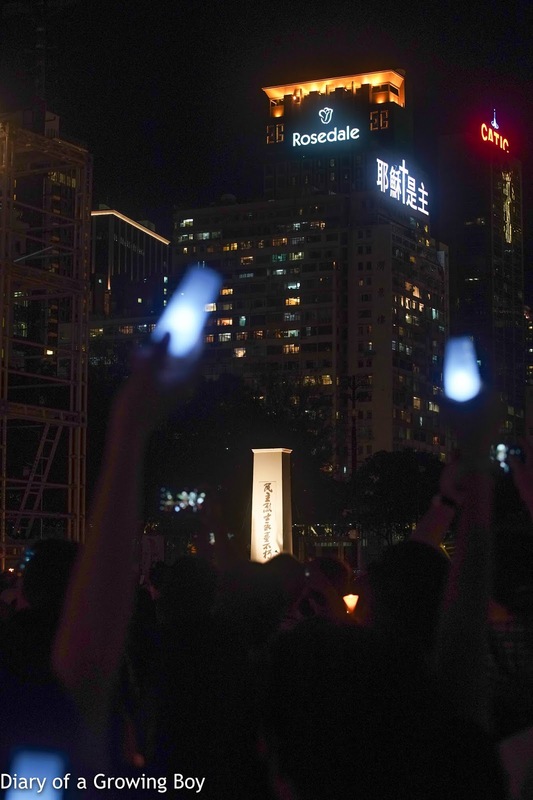 I also ignored whoever was on a bullhorn telling people that no bloodshed occurred in Tiananmen Square on June 4, 1989 - and that we've been fed a pack of lies by foreign media. Well, actually, I wanted to wring that woman's neck, but decided it wasn't a good idea today. There was the usual singing of songs. Not being a regular, I didn't know any of them, and I didn't take a copy of the program with the lyrics printed on them. 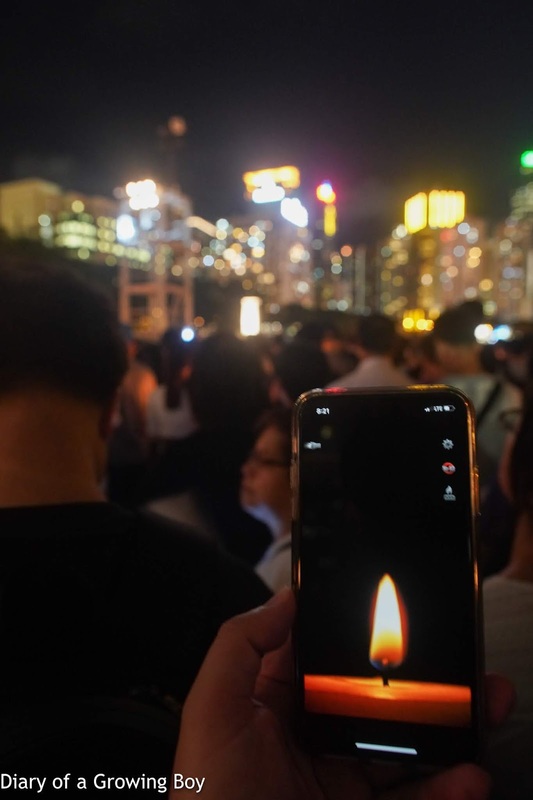 It wasn't until afterwards that I realized that one of the songs which are repeated at these vigils year after year is "Blood-stained Glory (血染的風采)", a patriotic song originally written about fallen soldiers of the People's Liberation Army after the Sino-Vietnamese War. 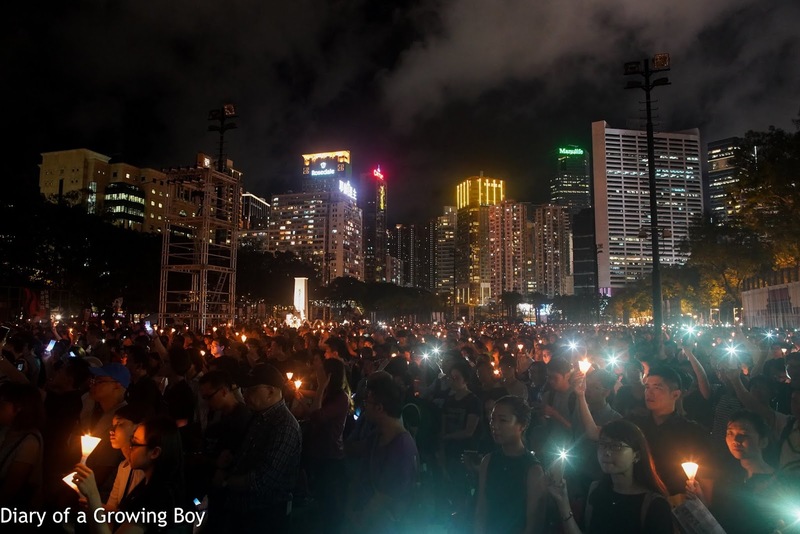 It has been sung by a number of people including the current Chinese First Lady Peng Liyuan (彭麗媛), but the version broadcast by the organizers of the vigil is sung by Wang Hong (王虹). 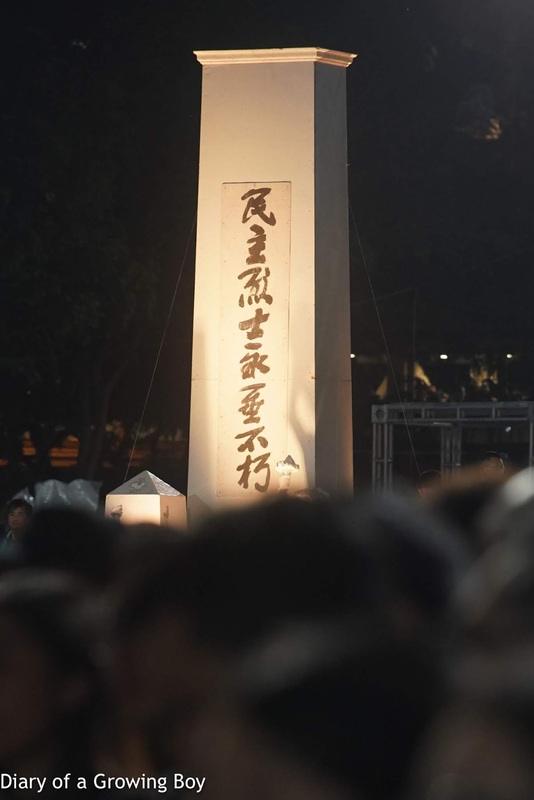 As usual, a replica of the Monument to the People's Heroes (“民主烈士永垂不朽”紀念碑) was erected and placed in the middle of the football fields, and we bowed respectfully as part of the program. A wreath was laid in front of it as the crowd paid their respects. 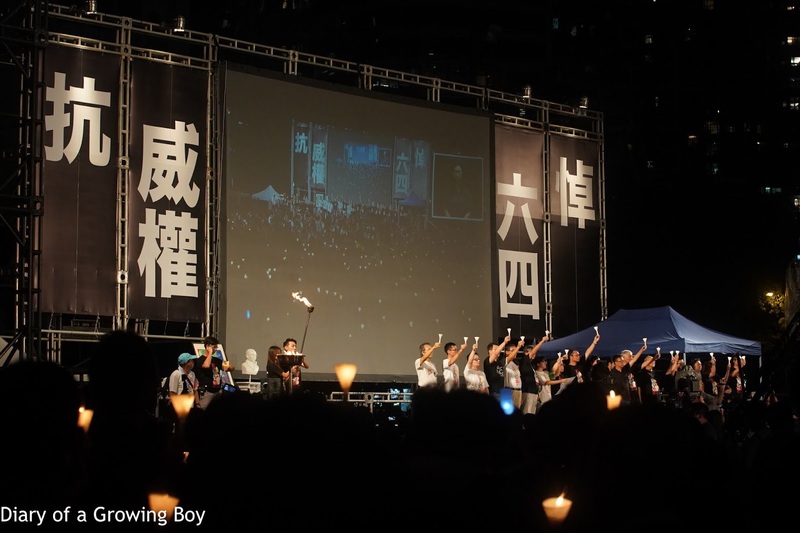 The organizers played a number of video clips featuring people whose lives were affected by the massacre, including one of the Tiananmen Mothers (天安門母親) - the poor group of women whose children were killed as part of the military suppression, but who are forbidden by the authorities to mourn the deaths of their loved ones. 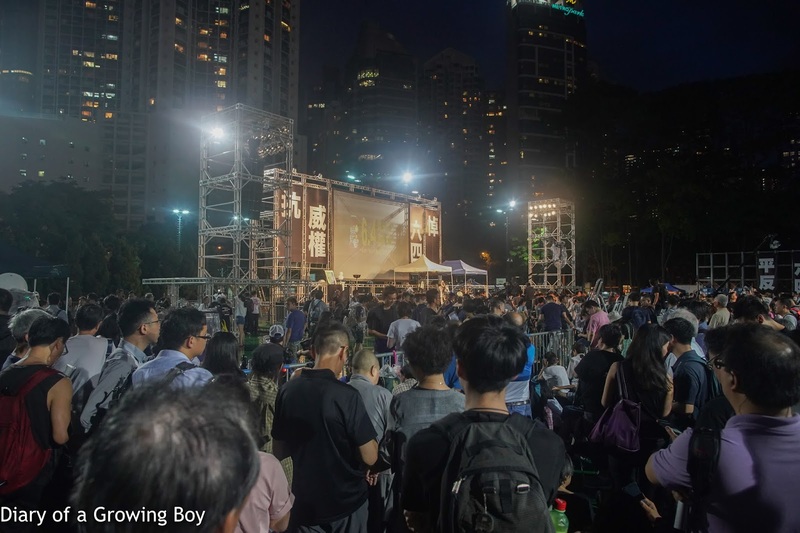 The organizers also had a special section on Liu Xiaobo (劉曉波), who had sadly passed away while serving his prison sentence since the last commemoration. His wife Liu Xia (劉霞) remains under house arrest. As usual, I chose not to take an actual candle - or an LED one - for the vigil. Instead I relied on the trusty app on my phone. I may not have the same effect in pictures, but it's certainly more environmentally friendly. We stayed for just under 2 hours tonight, as I didn't have much interest to sing along with the crowd. I've made the effort to be here to pay my respects, and kept my promise never to forget what happened 29 years ago. I'll be back next year for the 30th anniversary.